...and up to the cutting board. Kind of tricks the eye how it looks like tomato and onion, but you eat it and…Jesus Christ! Is that watermelon? It was so fresh and tasty that Stacey thought I should set it down in perpetuity (at least as long as this here internet thing lasts) for all to read and utilize on the good ole’ Second Dinner blog if Katya would be good enough to allow me, which she did. So…. Mix all of the above ingredients in a bowl. Taste. Does it taste good? No? Add more of something. After getting the right flavor, I gave the mixture a gentle little squeeze, releasing some of the liquid from the watermelon but not breaking it down completely). 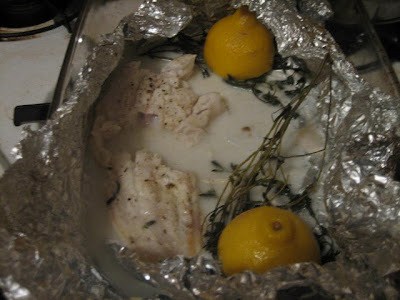 We used it to top some nice hake (a tasty and affordable white fish sometimes called whiting), which I seasoned with salt, pepper and a little olive oil and baked in a little tent of foil with lemon and sprigs of thyme at 325 degrees until flaky. That fish looked like this. 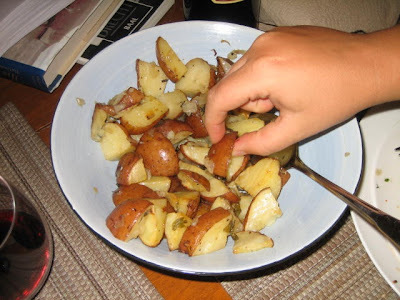 Finally, we had some nice potatoes (also of CSA share fame). I seasoned them with olive oil, salt, pepper, and fresh chopped sage leaves and roasted them in the oven at 325 until tender and golden and…damn, I have to go shop for more potatoes. Look at them! As you might have guessed, I was really happy with this meal. Seriously. Really happy. Ask Stacey. I think she wants to slap me. I won’t shut up about it. Ok. Thanks, Katya. You can have your blog back now. Thanks Avi. That sounds incredible. The other thing that CSA shares sometimes make you do is go out and buy a whole additional pile of groceries just so that you can have that perfect meal that someone else's CSA share provided. 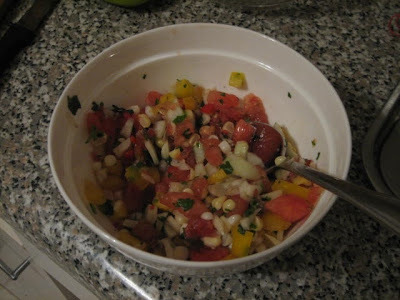 I'll be making that salsa as soon as I get my hands on some watermelon and corn, and maybe white fish. But for now, I have an appointment with some wilting basil and too many peppers. One step ahead of the guilt.